Traditionally I only used to use LaTeX to typeset documents, and it works perfectly when you have a single language script (e.g. only English or German). But as soon as you want to typeset Unicode text in multiple languages, you’re quickly out of luck. LaTeX is just not made for Unicode, and you need a lot of helper packages, documentation reading, and complicated configuration in your document to get it all right. All I wanted was to typeset the following Unicode text. It contains regular latin characters, chinese characters, modern greek and polytonic (ancient) greek. Latin text. 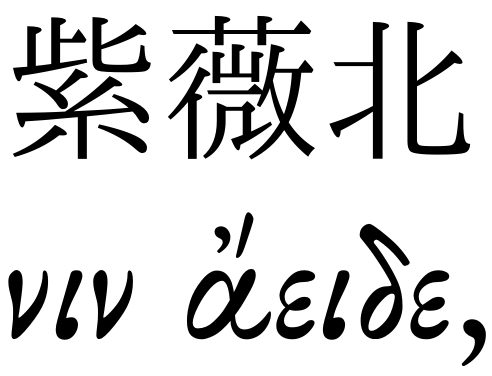 Chinese text: 紫薇北斗星 Modern greek: Διαμ πριμα εσθ ατ, κυο πχιλωσοπηια Ancient greek: Μῆνιν ἄειδε, θεά, Πηληϊάδεω Ἀχιλῆος. And regular latin text. It turns out that the missing unicode characters are not XeLaTeX’s fault. The problem is that the used font (XeLaTeX by default uses a slightly more encompassing Computer Modern font) has not all unicode characters implemented. To implement all unicode characters in a single font (about 1.1 million characters) is a monumental task, and there are only a small handful of fonts whose maintainers aim to have full support of all characters (one of them is GNU FreeFont, which is already part of the Debian distribution, and therefore available to XeLaTeX). 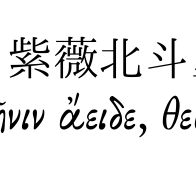 Now, greek worked, but still no chinese characters. It turned out that even fonts which are dedicated to unicode do not yet have all possible characters implemented. Because it’s a lot of work to produce high-quality fonts with matching styles for millions of possible characters. Life is the sequential collapse of systems at each level of resolution. You need to be the thing that transforms itself during a collapse so that you are there for the next system. That’s essentially death and rebirth. … People have to be disciplined enough to be part of a system, and flexible enough when the system fails. These are the two adaptive elements that allow the success of living.